Human Destiny is mysterious. Everyone suffers from certain miseries, sometimes in life. A very rich man enjoying all the luxuries of life may be unhappy due to marital-discord, lack of progeny or any other personal matter. On the other hand a middle class man blessed with all the domestic happiness may feel strangulated in material affairs. There are a very few who are fully satisfied or blessed in every aspect. And why is it so that for some, to achieve certain things in life they have to involve, as compared to others, very less efforts where as for some, to achieve certain things they have to really work very hard. There is definitely some kind of invisible cosmic force that helps and obstructs us in various ways in our day to day lives. Among the various ancient sacred texts available to mankind from thousands of years “THE VEDAS” are considered to be the oldest and the greatest wealth of information about this cosmic force that controls all living creatures on this Earth. “Vedas” are ancient Indian repositories of knowledge and the inheritance of Great Indian Sages and culture. There are four Vedas namely, Rig Veda, Yajur Veda, Atharva Veda and Sam Veda and of these the former three contain about 250 shlokas or treatise on the great Indian Divine Science dealing with the influences of planets and stars on Human affairs. The VEDAS are considered to be the words of GOD. 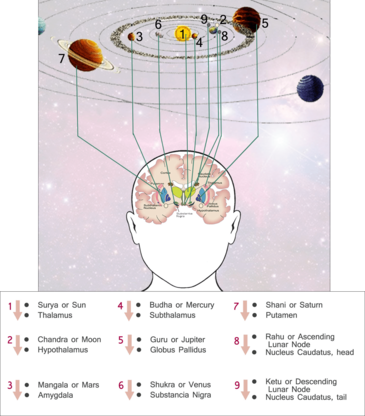 The ancient Hindu “Rishis”, a Sanskrit word meaning “Seers” or high priests of the Vedic knowledge understood the connection between the celestial bodies of our solar system and the human body. The motion of the planets and their positions in relation to each other, acts upon us throughout our lifetime, just as the lunar phases push and pull the oceans and the seas. This system has been made by the ALMIGHTY to control us, just like parents try to keep a control on their kids by punishing and/or rewarding them according to their deeds. In the same way we are also punished or rewarded by these planets according to the Karmas we perform. KARMA is the action of the past and partly action of the present taken by one’s free will. GOD has given us power of reasoning and wisdom of understanding and to judge the nature of our Karma. Whatever we commit is completely based on our discretion. We all reap the good and the bad effects of the karmas that are performed by us here on Earth (Bhu Loka) & since the entire creation as we know is bound singly by the law of karma and nothing can, has and ever will supersede this most powerful law made by God. Sri Vishnu, being the preserver of all the life on earth, has himself incarnated as 9 grahas (Planets) also known as Nava Grahas, each graham having different energies and effects acting upon different aspects of our lives , solely to bring forward the karmas of man, good or bad in the form of joys and sorrows. Every action performed by each one of us, is recorded instantly and sent into a supreme database, which knows exactly when the fruits of the particular karma must be reaped. The Sacred Vedas also teach us a system to mathematically calculate the movements and combinations of these planets from the date of birth, to know the future ups and downs in a person’s life, which is called Vedic Astrology. 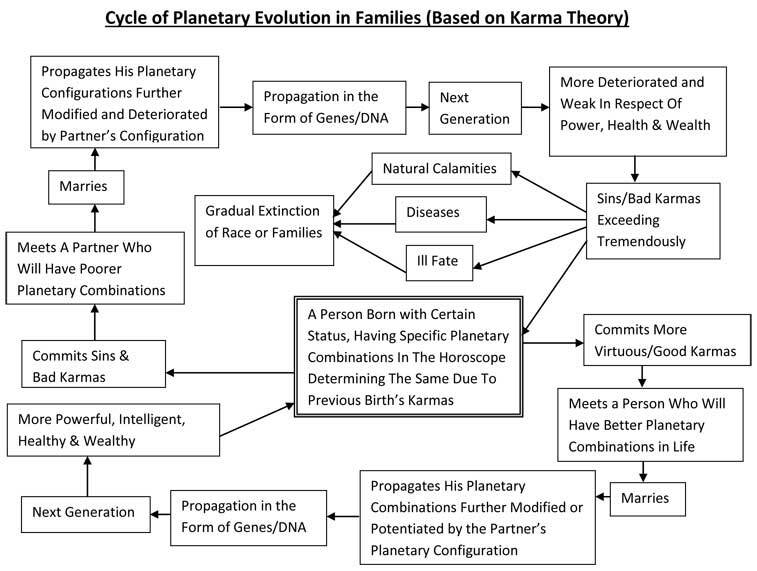 The karmic life of an individual starts as soon as he/she takes birth, and destiny or fate or sometimes referred to as karmic life map starts playing its role. All the milestones like good times & bad times, luxury phases and poverty, moments of happiness and despair, supreme strength and weaknesses, periods of power/respect as well as humiliation, focused mind and anxiety, perfect health and diseases, experience of love as well as failure in relationships, etc. during one's lifetime are concluded as karmic life map. This life map is the result of the karmas performed by that soul in its previous birth. Whatever Karma’s we had performed in our previous birth Results in the family or health and other circumstances we are born with, in this world. Like we say when a child is born in a wealthy family, he’s born with a silver spoon. But with the karmas of our present life we further improve or worsen this karmic life map of our’s. Like if we do good karmas we would get a good life partner, good business partners, servants,employer, staff and later on good children etc. And we become wealthier and happier in our lives but the opposite happens if we perform negative Karmas. This proves why a person born in a poor family becomes rich, successful and happier in his later life and why a person born in a wealthy family becomes poor, sick and gets a life full of miseries and ill fate. The divine science that VEDAS teach us to foresee our Karmic life map also teaches us certain remedial measures to combat the negative factors of this karmic life map. This divine science, called Vedic Astrology and also more popularly known as Jyotisa is held in highest esteem amongst the cultural treasures of India and is also regarded as the eyes of the VEDA. Jyotisa is a science with sound rules and parameters based on perfect logic, uses mathematics and astronomy to accurately pinpoint the exact location of the heavenly bodies to be considered at the times of birth. This system was first taught by Lord Shiva to Brahma, the creator who then taught this to 18 other Rishis (celestial Sages) and ever since then, this knowledge has flowed down from generation to generation. Permutations, combinations, different sets of calculations and planetary relationships formed with each other also known as Yogas are the core elements of Vedic Astrology which are different for each person born on Earth, just like thumb fingerprints which are not even the same for twins. Western Astrology, Chinese Astrology, Herbrew Astrology, Tajik Astrology and Indian Astrology. Among all these the Indian Astrology is the current version of the ancient Vedic Astrology. This Indian Astrology has influences of the Western and Muslim (Tajik) astrology on it. It has grown in the past 15 years with the availability of Texts in various languages and the use of computers to do the complex mathematical calculations. Indian astrology is a summation of Vedic Astrology in addition to global inputs that have come due to interactions of various cultures. According to the Vedas the several ways to improve our planetary karmic life map include meditation (chanting of Vedic mantras), Yoga (physical postures), Ayurvedic aushadha (natural medication), Colour Therapy, Donation, yagyas (form of Vedic planetary prayers) and Ratnas (wearing of Vedic Planetray Gemstones and talismans). In addition, one should regularly pray to the Almighty. He should be content, humane, helping the poor and needy, kind, generous and benevolent. Avoidance of anger, pride, greed, cheating, envy and deep involvement in sensual pleasures further act as adjuvant. These ways have been tried and tested for thousands of years and found to be very effective. In Vedic Astrology the nine planets that control our lives are SUN, MOON, MARS, MERCURY, JUPITER, VENUS AND SATURN (known as the visible planets) along with two lunar nodes, RAHU (ascending lunar node) and KETU (descending lunar node). These nodes are the two intersecting points of the solar and the lunar planes as seen from the Earth. Ratnas or Gems, nature’s colourful gift, absorb the cosmic rays and energies of planets and produce their eternal effect on us. This cosmic effect of Gems has been referred to in the Vedas. From the Vedic era therapeutic application of gems has also been understood. Indian Sages used them in four forms namely churna (powder), Brahma (Calcined), Rasayana (Chemical), Dharna (wearing on body). Here we are only discussing their usage in the modern context and mainly concerned with Dharna of gem stone to ward off or mitigate negative influence of destiny and to potentiate benefic influences of the planets. Associated with the SUN is the RUBY, with the MOON is the PEARL, with MARS is the RED CORAL, with MERCURY the EMERALD, with JUPITER the YELLOW SAPPHIRE, with VENUS is the DIAMOND, with SATURN the BLUE SAPPHIRE, with RAHU the HESSONITE GARNET and with KETU is the CHRYSOBERYL CATS EYE. Associated with the nine planets are also the days of the week, different parts of the human body and different metals. A learned Vedic Astrologer can make an accurate horoscope of an individual by his/her date of birth, time & location of birth and can easily identify the benefic planets in an individual’s life which are falling in the weak houses. If the Vedic Gems of those benefic weak planets are worn with their proper rituals and timings they can potentiate those planets and can benefit the life of that individual in a great way.